Robert Robot facilitates creative play with children – ixd! Media Footage: A video and high-resolution photographs of Robert Robot are available rights-free at https://www.hcc.aau.dk/RobertRobot. Copenhagen. 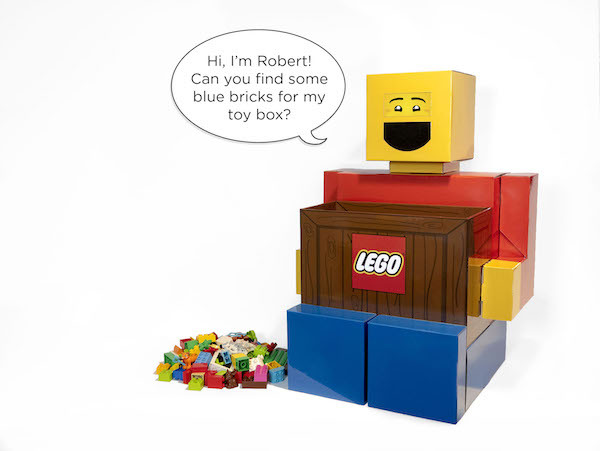 February 14-17, 2019, children and families visiting the LEGO® World event in Copenhagen, Denmark will have the chance to meet and play with Robert Robot! Four child-sized playmates will be placed in and around the exhibition hall enabling visitors to hang out and play. Robert Robot asks kids to find and build special creations with LEGO® DUPLO® bricks and challenges them to find special colors or shapes. Kids become physically active as they work together socially with other kids to find and collect the bricks!